I know you think we’re everywhere. You know, the JEWS. The Children of Israel. The Hebrews, as some of you may call us. We run the media. We are up in everyone’s business. We own Hollywood, right? Well, if so, tell me this my friends: where, oh where, are the Chanukah movies? I know, I know. There are a few; chock-full of stereotypes and crass Jewish humor, I might add. Well you know what? It’s lame. It’s hard. And I want to talk about it. Gentiles get so many movies about Christmas for the entire month of December. Your local television stations replay old Christmas movies in case you missed them in the theatres the first time around because you were probably busy seeing the 10 other Christmas movies released at the same time! That’s a lot of movies about Christmas. Funny ones, sad ones, animated, computer animated; it’s like the movie executives are creating new ways to make movies solely for the purpose of making newer, better Christmas movies! Speaking of elves, the only Christmas feature film I have ever seen besides It’s a Wonderful Life (which is awesome) is Elf. I loved it because it poked fun at the Christmas myth; at the hysteria; at the madness that Christmas infuses into our lives every year. It also had a feel-good message, Zooey Deschanel, and the impossibly perfect Will Ferrell. I think I did pretty well to pick that movie as the only Christmas movie I have ever seen. It’s hard to top so I may not try. I know deep in my Jewish heart that I don’t want to celebrate Christmas; never have, and probably never will. But I guess I might like to feel that Chanukah is – even for 90 minutes – worthy of a movie that could capture the complexity, the struggles, the comedy, and the family dynamics of the Festival of Lights. For example, did you know that in my family there is a heated debate about whether latkes ought to be grated or mashed? It’s intense. Put that in a movie, people. Another example: Some families do 8 nights of presents, but I grew up with only one night of presents and 7 days thereafter of pencils, chocolate gelt, and maybe a light-up dreydl. That stung. Put that in a movie. How about this? I hate shopping and I also dislike crowds. I am ecstatic to not be a part of Black Friday and it makes me feel smug and self-righteous: PUT THAT IN A MOVIE. Think about the children, oh producers and writers of Hollywood. Think of my sweet boys, being raised in a world that does not speak to them in the language of cinema for the months of November and December. Imagine the possibilities if there was such a movie! Name a Jewish celebrity, any Jewish celebrity. I’ll help you: Natalie Portman. Andy Samberg. Adam Sandler. Gwyneth Paltrow (Gwyneth is Jewish!) We could have the awesomest movie ever if we cast all of the famous Jews in it. We don’t even have to call it a Chanukah movie. We don’t even have to mention Chanukah. Heck, maybe they could all play Christmas-celebrating Gentiles! They’re actors, it’s all good! 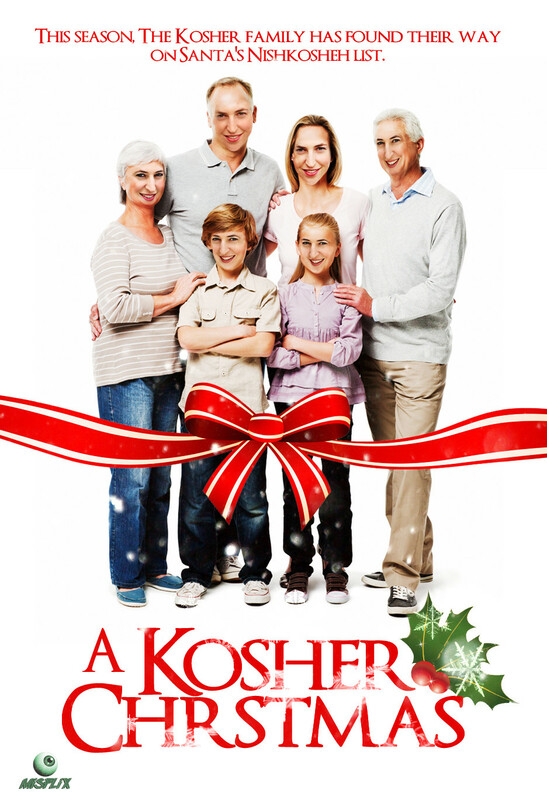 Just release this movie of my dreams around Chanukah. We Jews will send out signals through our secret channels of show business (through the manholes beneath your cities, and through silent codes communicated through glances in supermarkets) and we will all know it’s a Chanukah movie even if you don’t call it that. In public, we will simply marvel at the talent, the strong features, the bold plotlines…knowing full well it’s our Chanukah movie. Mayim Bialik is best known for her portrayal of Blossom in the 1990s sitcom and of Amy Farrah Fowler on The Big Bang Theory. Bialik writes regularly for Kveller.com and has a book on parenting, Beyond the Sling: A Real-Life Guide to Raising Confident, Loving Children the Attachment Parenting Way. Headshots by Denise Herrick Borchert. Rashi Rosenzweig December 15, 2011	Log in to reply. Hi Mayim: We’ve written each other on Facebook. Thanks so much for this article and all I can say is Baruch Hashem where I live, the 25th of December is the first day of our work week – kids are in school, we’re at work, banks & posts are open, chanukah cheer is in the air with people chowing down on donuts & latkes and most every window has a menorah in it.. I love it and I wouldn’t trade it in for anything. Your blogs like this are so important and truly treasured. Thanks for making a beautiful kiddish Hashem. Ra’anana, Israel (formerly of New York). davidwag December 15, 2011	Log in to reply. Chani December 15, 2011	Log in to reply. the family chanukah party also has to be in the movie. along with oil vs. candles vs. electric. Melody December 15, 2011	Log in to reply. Great article………I hope someone takes you up on your suggestions and make a great Chanukah movie………..wouldnt that be nice ??? Does anyone else have more suggestions for Mayim? Jane December 16, 2011	Log in to reply. You got the funding? We’ve got the script!!! Jennifer December 21, 2011	Log in to reply. Now, I know that this one was never broadcast on TV, but if you want a fun and funny Channukah special, check out chabad.org Itchy and Kadoozy Channukah adventure. It’s done in 3 or 4 parts and will induce fits of giggles.